Yesterday, fans got their first official look at the summer comedy Central Intelligence, with new photos featuring stars Kevin Hart and Dwayne Johnson. Today Warner Bros. has unveiled the first trailer, which features Dwayne Johnson like you've never seen him before, as a fat guy. Don't worry, The Rock is still in great shape, but this trailer features a flashback to his character Bob's high school days, where he wasn't in peak physical condition. The story follows a one-time bullied geek who grew up to be a lethal CIA agent (Dwayne Johnson), coming home for his high school reunion. Claiming to be on a top-secret case, he enlists the help of the former "big man on campus" (Kevin Hart), now an accountant who misses his glory days. But before the numbers-cruncher realizes what he's getting into, it's too late to get out, as his increasingly unpredictable new friend drags him through a world of shoot-outs, double-crosses and espionage that could get them both killed in more ways than he can count. Central Intelligence also stars Amy Ryan, Aaron Paul, Brett Azar, Danielle Nicolet, Mark Burzenski and Bobby Brown. If that wasn't enough, we also have three posters, which employ both of the main stars' actual names into the tagline, revealing that "Saving the world takes a little Hart and a big Johnson." Central Intelligence is set to hit theaters on June 17, 2016, putting it up against Pixar's animated sequel Finding Dory. Rawson Marshall Thurber (We're the Millers, Dodgeball: A True Underdog Story) directs from a screenplay he co-wrote with Ike Barinholtz & David Stassen. This upcoming comedy is produced by Scott Stuber, Peter Principato, Paul Young and Michael Fottrell. Serving as executive producers are Ed Helms, who worked with Thurber on We're the Millers, Samuel J. Brown and Michael Disco. 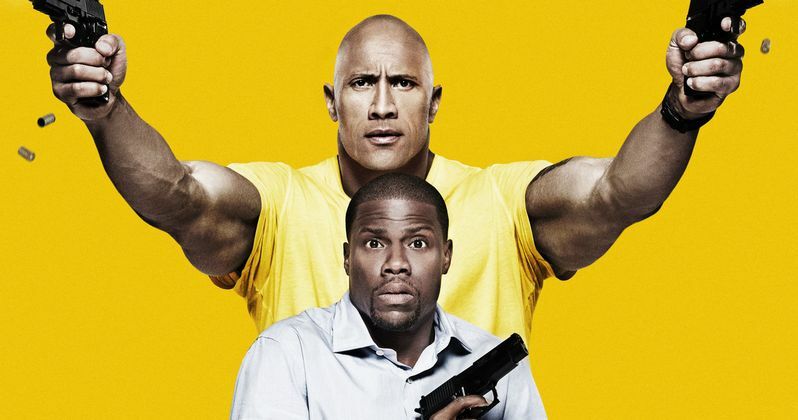 Yesterday's report revealed that Dwayne Johnson, best known for his action-packed roles, will be providing most of the comedy in Central Intelligence, while comedic superstar Kevin Hart plays the "straight man." As you can see in the trailer below, while Dwayne Johnson's Bob may be a massive covert agent, he's still a bit of a nerd at heart. Take a look at the first trailer and posters for Central Intelligence, and stay tuned for more on this upcoming action-comedy.